I wasn’t that excited this year before the Olympics started. Probably all the negative reports about conditions in Rio. I don’t know. But then, once it got going, there I was, tuning in every night. I’m sure the strong Canadian performance had a lot to do with it. Penny Oleksiak and the rest of the swimmers; Andre De Grasse and the Canadian track team. But it wasn’t just the Canadians. Watching the young Brazilian duel with the French champion in men’s pole vault was amazingly exciting. Who knew? 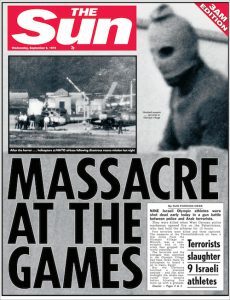 My earliest Olympic memories are from Munich in 1972. I was still only eight years old; a little under two months away from my ninth birthday. 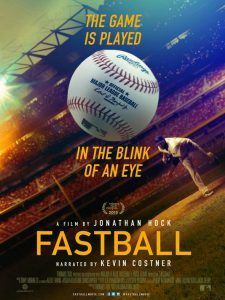 I can’t really remember how much I saw. 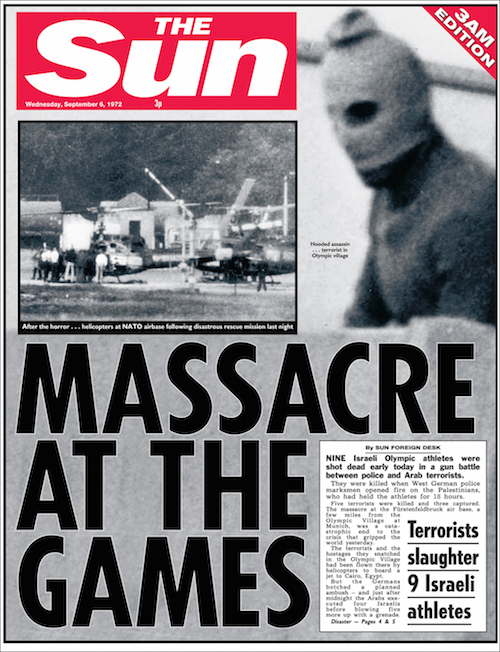 I was certainly aware of the hostage-taking and eventual murder of the Israeli athletes. And I knew Mark Spitz won seven gold medals. Pretty sure I saw at least one of his races. Probably on Channel 7, ABC from Buffalo, with Jim McKay hosting. 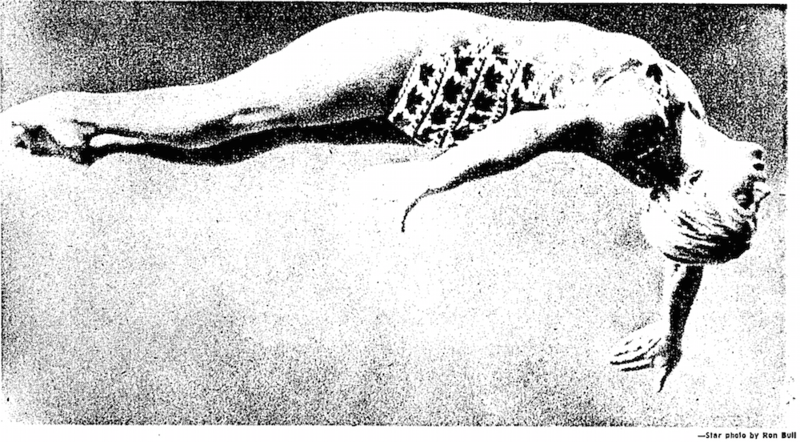 The Munich Games ran from August 26 to September 11, 1972. My grandfather died that August 26. Team Canada and the Soviets played all four Canadian games of the Summit Series between September 2 and September 8. All three of those incidents seem so separate and distinct to me. Funny how our memories work. 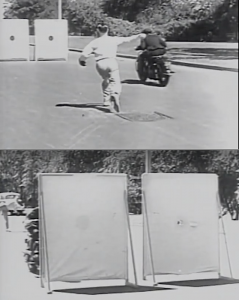 It’s funny what I remember about the 1976 Olympics in Montreal. Yes, I know Nadia Comaneci was the star with those perfect 10s in gymnastics, but I’m not sure I ever saw her perform. Pretty sure I did see Greg Joy win silver in the high jump, but I may be mixing that up with how many times I’ve seen it since! Then again, I have very distinct memories of U.S. gold medalist Dwight Stones, so I must have been watching. I also remember Lasse Viren winning double gold in the 5,000 and 10,000 meters (which he had done previously in Munich). But what I remember best from Montreal in 1976 is Cindy Shatto in platform diving. 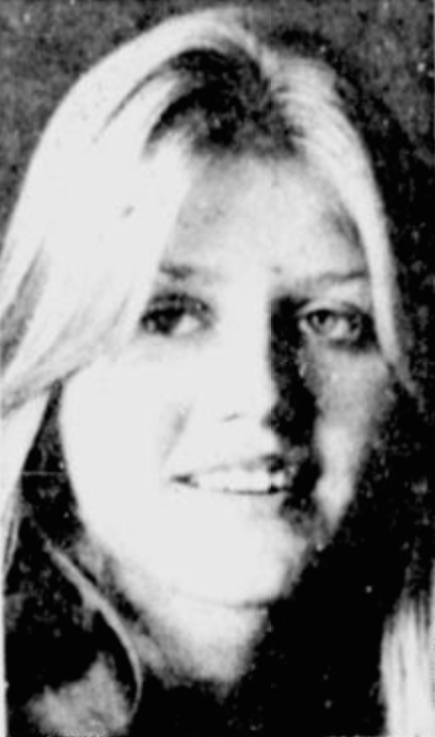 Montreal Gazette, July 26, 1976. I didn’t know it until I was writing this story, but Cindy Shatto died of lung cancer back in 2011. She was only 54. Very exciting to watch the Men’s 100-meter final on Sunday night. Nice to see Andre De Grasse come through on the big stage. Gotta like his chances for gold in 2020 … although a lot can happen in four years. Exciting as this race was, let’s face it. If you’re old enough to remember, it was nothing like the thrill of Friday night, September 23, 1988. 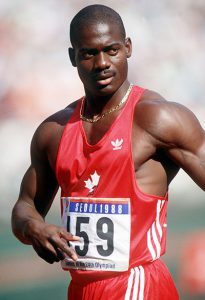 Ben Johnson’s win over Carl Lewis seemed like one of those defining “where were you when” moments we’d always remember. I guess it still is – but not for the right reasons. I watched the race late that night Friday night in the basement of a friend’s house. 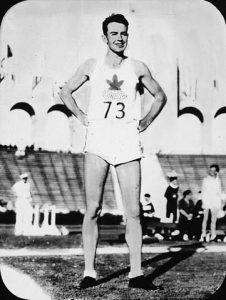 When I woke up on Saturday, still buzzing with the excitement of it, I wrote a story about the history of Canadian sprinters (Bobby Kerr, Percy Williams, Harry Jerome) that I then submitted to the Toronto Star. There was no email in those days, and I wish I could remember for sure, but I must have driven down to the Toronto Star building later that day, or some time on Sunday, to deliver my story. What I do remember for certain was calling Gerry Hall, the Toronto Star sports editor, on Monday. Did he like the story? Was he interested? 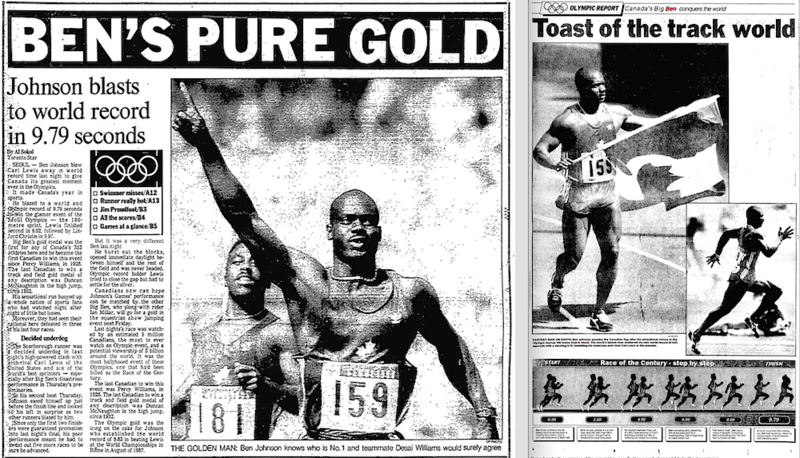 Toronto Star stories on Saturday and Sunday, September 24-25, 1988. Yes, and yes! But then he told me that they’d just gotten word that someone in Seoul had tested positive for steroids. 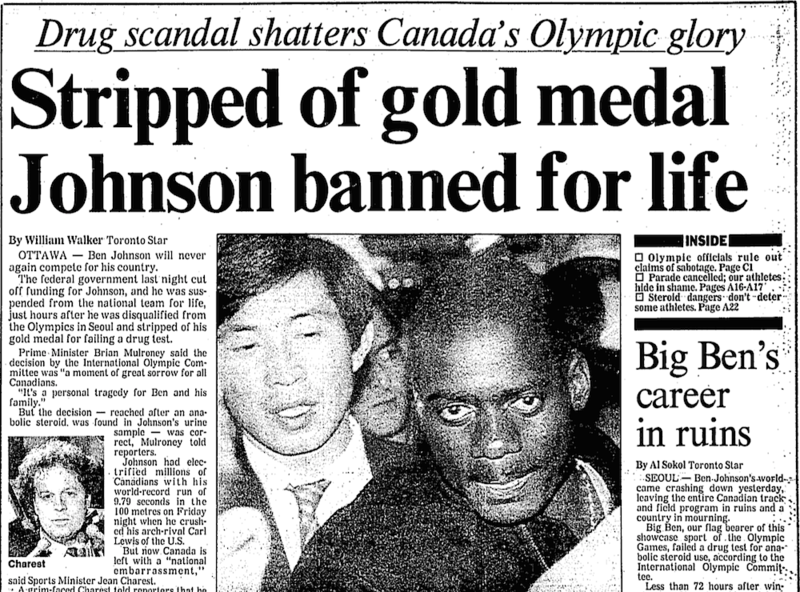 When it turned out to be Ben Johnson, well … let’s just say there was no longer any interest in my story. Front page of the Toronto Star, September 27, 1988.